Phew! It's been a long time coming, but the 2013 holiday season looks set to put millions fewer American credit card users under financial stress than any other recent one. In fact, when it comes to their plastic, they may be in better shape now than for a very long time. The good news was contained in two reports that were released on Nov. 19 and 20. The first, from S&P Dow Jones Indices and Experian, found the credit card default rate in October down to 2.97 percent, the first time in the history of the index that it has dipped below 3.0 percent. It was at 3.68 percent during the same month last year. When you add in some other forms of debt -- first and second mortgages, and auto loans -- the composite results remained similarly positive, leading company spokesperson David M. Blitzer to remark in a statement, "Consumer financial well-being is in a good shape." The second study came from TransUnion, like Experian, one of the big three credit bureaus. It reported credit card delinquencies (before an account is in default, but after it's 90 days or more past due) at just 1.36 percent in the third quarter of this year. That's down from 1.50 percent during the same period in 2012. The two reports together paint a clear picture of many fewer Americans struggling to stay on top of their plastic. 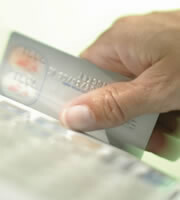 The TransUnion study revealed yet more favorable data: credit card debt is in decline. At $5,235 per borrower in the third quarter of 2013, the average balance must still sound scary to those who owe nothing on their plastic, but, after some rises and falls, it's 1.3 percent down on the same time last year. That trend is borne out by the Federal Reserve's consumer credit figures. These show "revolving credit," which is nearly all credit card debt, at $846.9 billion in Q3. That's $4.7 billion down on the previous quarter, though $1.1 billion up on the average across 2012. To get a real feel for how things have changed, you need to compare the numbers with those for 2009 ($917.2 billion) and 2008 ($1,005.2 billion). Before the nation starts loosening the corks on its champagne bottles, it's important to recognize a wider picture. Credit card debt may be way down on 2008, but overall consumer credit is up. The Fed's data, which exclude mortgages, reveal that other forms of borrowing ("non-revolving credit," notably student and auto loans) pushed the indebtedness of consumers above $3 trillion for the first time earlier this year. That compares with $2.65 trillion five years ago. Of course, these student and auto loans tend to come with much lower interest rates than those charged on plastic, so that additional borrowing may be easier to manage for many households than the same amount added to card balances. It's easy to toss around all these national averages, and forget that there are significant variations within the country. For example, TransUnion reports Q3 credit card delinquencies plummeting 19.1 percent year-over-year in Massachusetts, but remaining unchanged in North Dakota. Meanwhile, S&P/Experian measured the default rate across credit cards, auto loans and (first and second) mortgages in the five metropolitan statistical areas. In October, that rate was 1.25 percent in Los Angeles, but 2.11 percent in Miami. The real-estate market is one of the main factors affecting both consumer confidence and attitudes to debt, and that, of course, varies enormously across the nation. If you still have negative equity (in other words, your mortgage is underwater; you owe more on your loan than the current market value of your home), you're likely to be much more worried about your overall borrowing than someone who has the comfort of knowing they can always realize significant amounts of cash by downsizing or refinancing. So someone in North Dakota, where 36.4 percent of all mortgages were underwater in September, may feel differently about card balances from someone in Montana, where only 3.8 percent of homeowners had negative equity that month, according to the November edition of CoreLogic's MarketPulse. Unseasonably depressing? Cheer up. The previous month's edition of that publication revealed that 40 percent of all the underwater mortgages in Q4 2011 had positive equity 18 months later. That's 5 million Americans who over that period could once again see their homes as assets. And that number looks set to continue to grow, though patchily across the nation, as long as home prices remain on their current sharply rising trend. "It appears that, with continued strong credit performance and relatively low debt levels, consumers may be in a strong position to receive more attractive, feature-rich offers from credit card lenders," Ezra Becker, TransUnion vice president of research and consulting, said in a written statement. In other words, card issuers may soon to be wooing you with improved perks and richer rewards. Now that's a gift worth looking forward to. 0 Responses to "Credit card users in good shape for holidays"